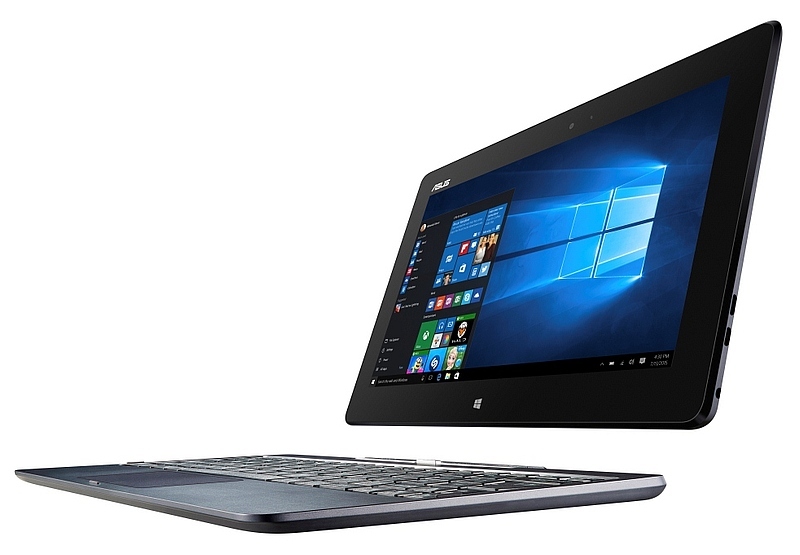 Asus on Tuesday launched its Windows 10-powered Transformer Book T100HA in India with a base price of Rs. 23,990. The laptop-tablet hybrid was introduced by the Taiwanese tech firm back in June last year at Computex. The Asus Transformer Book T100HA features a 10.1-inch detachable LED back-lit display with WXGA (1280×800 pixels) resolution and pixel density of 129 ppi that doubles up as a tablet. The 2-in-1 is powered by a 64-bit quad-core Intel Atom x5-Z8500 processor (up to 2MB cache, four cores, four threads, base clock speed at 1.44GHz, burst clock speed at 2.24GHz) clubbed with 2GB of RAM. A 5-megapixel rear camera along with a 2-megapixel front-facing camera is also present. The 2-in-1 houses 64GB eMMC inbuilt storage. On the connectivity front, there is a USB Type-C port, a USB 2.0 port, a Micro-USB 2.0 port, a Micro-HDMI port, and a 3.5mm headphone jack, spread across the keyboard dock and the tablet display. Also included are Wi-Fi 802.11 a/g/n and Bluetooth 4.0. The Book T100HA comes with 30Whr battery, which as the company claims, lasts for up to 12 hours on a single charge under ‘normal’ usage. As per the company, the Fast Charging technology in the 2-in-1 tablet can charge the Transformer Book T100HA from 0-80 percent in 2 hours. The keyboard dock connects to the Transformer Book T100HA using neodymium magnets. The hybrid comes in Tin Gray and Aqua Blue colour options in India. Weighing 580 grams (without keyboard), the Transformer Book T100HA measures 265x175x15.4mm and sports a metallic finish. Since it runs Windows 10 operating system, users can expected the 2-in-1 to feature Microsoft Office Mobile, Continuum mode, Cortana virtual voice assistant, and other Microsoft-based applications.